From monitoring the recipe make, maturation and grading, through to the block of cheese being cut, its yield, giveaway and distribution. We’ve invested our know-how into design a set of software to manage and add value to every one of your processes. Due to the wealth of experience we’ve gained within the cheese and dairy industry, we’re constantly modifying and adapting our solutions to meet the changing demands of the industry. We’ve worked closely with our customers, including South Caernarfon Creameries, Exton Foods, Cropwell Bishop Creameries, Butlers Farmhouse Cheeses and the Caledonian Cheese Company, to shape system modifications that capture key information for dairy companies and processors alike. 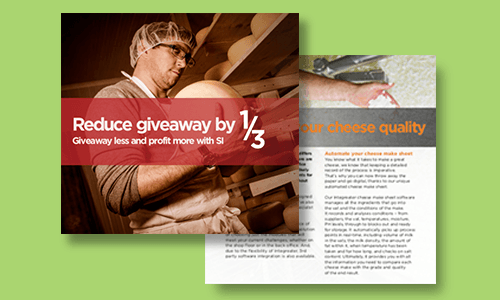 The team at SI has an intricate understanding of the cheese make and processing industry. From monitoring the recipe make, maturation process, and the flow of the production line through to the block of cheese being cut, labelled and put into the storeroom, maturation and grading, and finally, distribution or further processing – our software can govern every process. 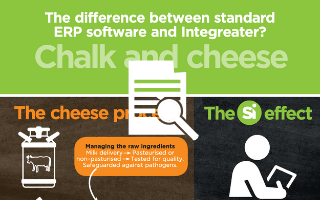 SI’s unique cheese processing technology tracks and captures in real-time a huge amount of data about each batch of cheese – from raw ingredients through to the finished product. With real-time information at your fingertips, you will be able to identify and rectify any issues immediately. For instance, you will be able to understand why a block or batch is producing more off-cuts than expected during processing, analyse how best to improve performance and decrease waste. Gain complete visibility of your processes, traceability, yield and giveaway, with Integreater at the heart of your cheese business.